Information: Roy and Libby McCutchan, instigators of square dance and folk dance groups and camps throughout Texas, New Mexico, Oklahoma, and Louisiana. The story of Roy and Zibby's involvement with folk dancing started with their meeting at the University of Texas (U.T.) in 1938. In those days there was only UT-Austin, and the Swing and Turn Club was only just starting. For the next two years, Roy and Zibby worked and promoted the club as it grew from "hard to scrape up a square," to 20 to 30 people. Roy was born in 1919 and grew up in El Paso, Texas, immersed in West Texas culture and social dancing, which included traditional dances such as squares, Heel and Toe Polka, and Varsoviana. Elizabeth "Zibby" Wolfolk was born in 1915 and grew up in Wisconsin. She came to U.T. in 1939, and she and Roy were married in 1941. While Roy was in the navy during World War II, Zibby was in San Francisco, and started dancing with Chang's group, as well as with several others. She became enamored of international folk dance and when they returned to Austin, they both started dancing with the first co-ed physical training class at U.T. in 1947, led by Jane Pittman and Marlys Swenson. This was the nucleus of the Austin folk dance group  the start in Texas. Noted folk dance leader George Lowrey came out of that class. Lowrey and the internationally known folk dance entrepreneur Rickey Holden learned their early square dancing from Roy. Two of the biggest influences in Texas folk dancing were the Texas Folk Dance Camp and the camps at Idlewilde, a YWCA girls' camp near Comfort, Texas. The Texas Folk Dance Camp started in January 1949 and has been held since then on Thanksgiving. It began with the minimum amount of organization and about 20 people, and it is hard to say officially, who did what. But for 30 years, those people served on whatever form of board existed and supplied a driving force  a spark for fun, parties, food, music, all night dancing, and even some organization at times. Roy and Zibby drove to Wisconsin frequently during the 1950s and 1960s, visiting Zibby's family and dancing at Jane Farwell's Folklore Village outside of Dodgeville. Thus, Farwell became an extremely important influence on Texas folk dancing, with her emphasis on the recreational aspects of dance, costumes, decorations, meals, and parties. Roy and Zibby also toured Yugoslavia with the Duquesne University Tamburitzans and thereby became the early proponents of "kolo dancing" in Texas. As the camp became larger and organization began to grow, Roy and Zibby were officially co-chairman for two years and Zibby was food chairman for 17. 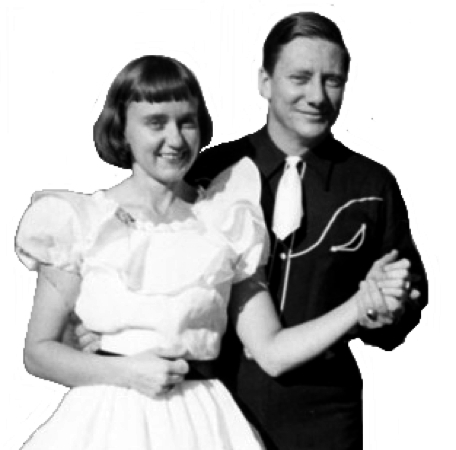 They brought notables such as Farwell and Alura Flores de Angeles to Texas, which for years made Texas folk dancing unique. With help from others, Roy's trumpet fanfares grew into a 17-piece orchestra. Roy and Zibby remained on the Texas Camp committee until the early 1970s, at which time the trend away from recreation and toward formalization, in Roy's words, "made them realize that they were no longer needed." They then began to support Ron Houston's recreation-oriented Annual Erratic Spring-Easter and Fall Folk Dance Camps in Austin, Texas, and did so for the next 20 years. The second major influence on Texas folk dancing was the series of Idlewilde folk dance camps. The time of this can't be accurately fixed because it didn't start, it just began to happen. A bunch from the San Antonio YWCA would go and loaf, read, swim, canoe, ride horses, and dance. Other friends from around the state began to join them. Except for time out for eating there was 24-hour request dancing. The importance to the Texas area folk dance was that Idlewilde served as a place to review and learn the material from the Thanksgiving camp. Leaders from each group would remember some of the dances that they liked, but by the time everyone had swapped and traded for several Idlewildes, there was a common repertoire. Again with much help, Roy and Zibby supplied the spark and drive to make this happen. Zibby's degrees and training were in nutrition and food service, and she was a tremendous help in organizing the meals at Texas Camp and at Idlewilde. Roy organized the music, both recorded and live, and supervised the swimming pool. Their influence spread over what we should call the Texas area. Every time they moved to a place without folk dancing, they started a group. In Los Alamos, New Mexico, they started both square and folk dance groups and a New Mexico camp type workshop. In Marshall, Texas, a group was started which continued and spread into Louisiana. Also enthusiasts from San Antonio spread the activity to Corpus Christi, Iowa City, Monterrey [Mexico], and Oklahoma. They also infected family members with the folk dance fever: Nell McCutchan of Emeryville, California and Betty Branch of Medford, Oregon. Roy said, "Truly the real accomplishment that made all other accomplishments possible, was the GATHERING of such a wonderful, creative, energetic, and loving group of friends, who were always ready to help: to plan a party or a meal, an impromptu skit or joke, to sweep a floor or dance on it, to sing, play music, decorate or costume, and to help a beginner. It was this group that made things happen." Zibby died on May 1, 1983 after an epic battle with cancer. Roy wanted their vast collection of folk dance costumes to be used, so he took them to Jane Frwell's Folklore Village outside of Dodgeville, Wisconsin. There, he met and married Jane's incredibly competent Executive Director, Jane Seaton. They returned to Texas, where Jane initiated adult education programs in Boerne, Texas. They moved to Jane's native England in the late 1990s, and Roy gave his 60-year collection of folk dance materials to the Society of Folk Dance Historians Archives. I would not call Roy particularly dynamic or energetic, but tireless and incredibly principled, perhaps from his youth as an Eagle Scout. He never gave up hope and worked across the decades to revive traditional West Texas square_dancing and to re-infuse recreation, that "do it yourself" attitude, into folk dancing. Roy passed away on Easter Sunday, April 16, 2006, a classic case of "wearing out" rather than "rusting out," forgotten by most, but never by me.